As we were getting ready the night before Sojo's assembly, she mentioned that they could wear something from their culture. I suggested her Old Navy tshirt with the American flag, and she suggested her Chinese dress. Seems like an ordinary request, but this is from the girl who has refused to wear any dress for almost three years. Her motto is "it's my body and my choice" which I wholeheartedly love, and I sincerely hope she clings to that motto forever. But, she wanted the qi pao, and that was beautiful in that it is her heritage. Only problem is that the qi pao is a few years old, and it was tight. I cut the side to make it fit, and we pinned it on her the next morning. A last minute change for her was letting her hair down--another thing she very rarely does. I knew the day was special for her, but these added extras made it obvious that this was truly an important day for her. The assembly itself was a huge hit, and I love that our focus at school is making them very kid-directed. Not to be overshadowed by her speech, she and a small group of friends made an entire Minecraft world that was akin to the true community of 2nd graders on stage. I had the chance to help them with this part of the show, and it was wildly creative. They made a community where everyone is welcome (the theme of the month was Cross Cultural Citizenship), and we made a movie of them traveling from landmark to landmark. She knocked it out of the park with her speech. Her poise, her confidence, her reading fluency! I was completely in awe, but I am most days when I'm with her. Sojo's class is in charge of this month's assembly at school, and the theme is cross-cultural citizenship. Our counselor told me later that she was chatting with the 2nd graders, getting them to tell stories about their own experiences of living abroad. She then asked if anyone would like to share a story on stage about their experiences, and Sojo raised her hand and said she wanted to talk about being adopted. Um...ok? Surprising (in the very best of ways) as she usually is hesitant to talk about being adopted. Sometimes she'll ask a question or two, and she knows many details of her story; however, for many years she has done much to avoid the subject overall. That being said, in the last few months, we have noticed there is a new depth to her questions and observations. After writing an essay of sorts about her experience, she brought it home to practice. Sitting at the dinner table listening to her, it was extremely hard to not cry as her beauty and innocence and goodness shines through. Most of all, the speech lets us know that she is in a good place with being adopted, and that is what we always hope for. Today is the day of her performance. And not to have her speech overshadow all the other coolness that is her, she and a small group of friends have worked tirelessly on creating an amazing Minecraft community that will be showcased as the backdrop of the show. She's made me promise not to cry (hello, empty promise!! I cry at everything, and how on earth could I not cry when this sweet girl talks about the kindness of her first mama who didn't want her to suffer? ), but the tears will be of joy, not sadness. We are both forever grateful that she came into our lives, and she fits so perfectly. Also grateful that she and I both embrace such a funky style--the above photo was just a regular day, and we both look so crazy! Crazy fabulous, that is. Bahrain is our family getaway place. About 3 hours from us, it is where we head for movies and malls, PF Changs and IHOP, abaya-free shopping and adult beverages. We normally have a routine of heading to the mall and staying at a hotel in the mall. This time, however, we ventured out about 30 minutes past the main area of town to a hotel right on the water. And the water is the most crystal blue ever, and that color against sand apprehends me every single time. We still hit the mall and movies, but we headed out to our new hotel around 3 p.m, in time for some afternoon beverages and a beautiful, albeit chilly, sunset view. Gilgamesh, Sojo's favorite friend, is in her arms enjoying the sunset as well. Dale and I realized that in every country we have lived in, we have had a place. Our place. Meaning a place to go to that felt like us, where they knew us and we could go if we needed a break. The thing is, we hadn't found that place in Saudi. Staying at a hotel in the mall is convenient, but it isn't the same as a balcony overlooking the water and an awesome buffet breakfast the next morning. So, we seem to have found our place here, and that feels good. 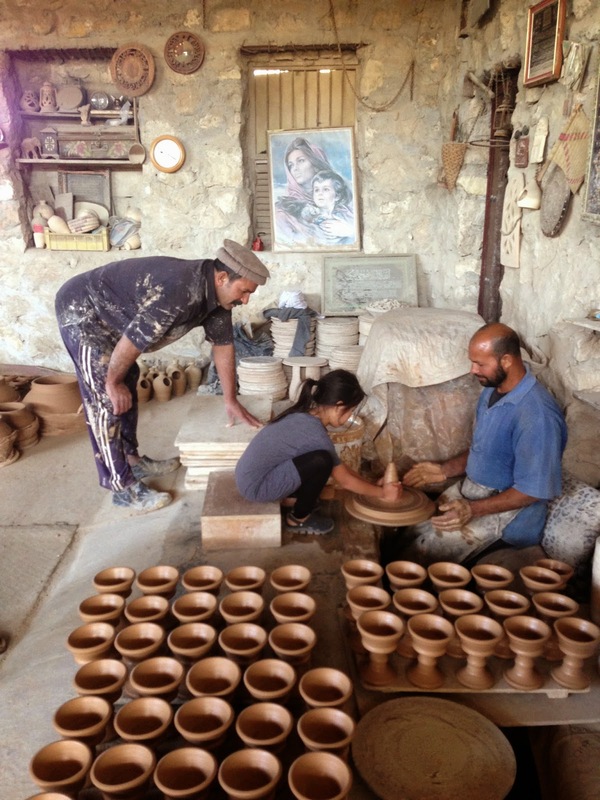 Since we were off the beaten track already, we decided to search for a pottery village called A'Ain. I can't really say it was a village as it was one small area with a shop, but the whole entire process of mountains of clay to making the pots to the kilns were there, so it was interesting. Sojo thought it was awesome, and the potters invited her to join them at the wheel right away. Definitely a interesting weekend for us all, and we are already thinking of when to go next. 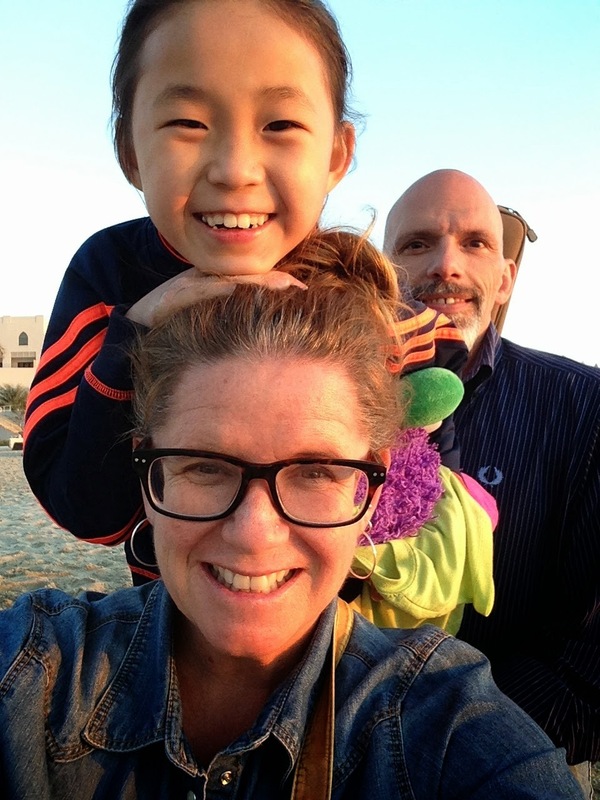 So often, I find myself awash in gratitude for my beautiful family. Today, as we walked to school after lunch, I snapped this shot. Seemingly ordinary, it is in fact teeming with all sorts of things pertaining to this very moment in time. *Leggings with athletic shorts over top. This new look is so funky as she randomly chooses everything, and somehow it all goes together. 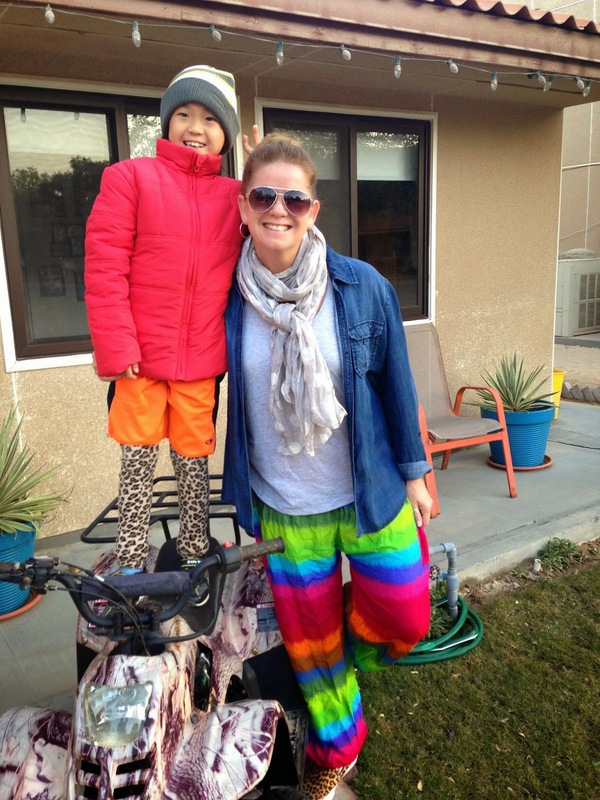 She can even pull off leopard leggings and neon orange shorts. *Carrying 3 spring rolls and sweet chili sauce to give to a friend who was envious of her snack the other day. On a side note, I have become a spring roll queen and have it down to a science. This is making my family incredibly happy. *Dale happily carrying Gilgamesh, Sojo's favorite stuffed animal, as well as her security blanket, Angry Bird T-shirt, that is now sewn to Gilgamesh so they don't lose each other. There is something going on of late in regards to security that is making her want to bring him to school every day. He stays in her backpack once we get there, but still...we are trying to figure out if it's a phase or something is bugging her. The small details of the windows of time are things I love to remember. A whole lot of cherishing going on.